Local meeting in Quincy, MA on Jan. 5. Photo by Sandy Eaton. 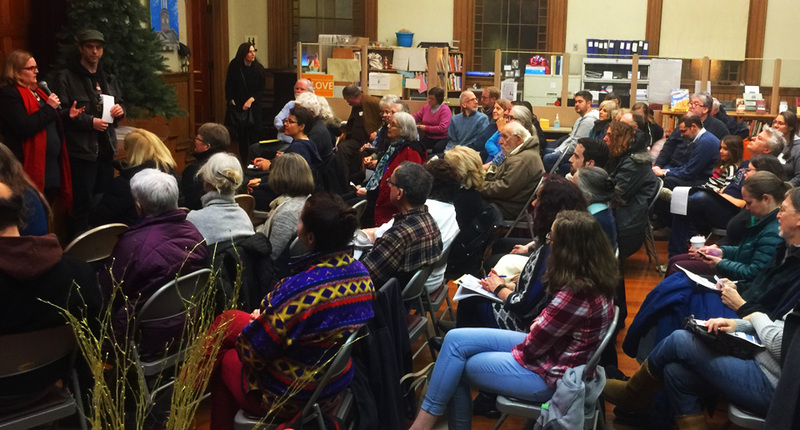 Over 120 people from across the Massachusetts South Shore and beyond gathered in the United First Parish Church in Quincy Square on January 5th to discuss their concerns regarding growing threats to human rights and the environment, and to plan actions to promote equality, fairness and a healthy climate. This event was sponsored by the South Shore People’s Network and the South Shore Coalition for Human Rights, and hosted by the church’s Social Justice Concerns Committee. Reverend Rebecca Froom, Minister of the Church of the Presidents, greeted everyone, and closed the meeting two hours later by leading all in song. Deanna White-Hebert, president of the South Shore Coalition for Human Rights, recalled the Coalition’s forty-year history of struggle against racism. She invited all to join it in carrying on this fight, starting with this year’s annual Martin Luther King commemoration in Germantown on January 16th. Nick Giannone, a union activist from North Weymouth, introduced four invited speakers and then chaired the lively discussion that followed. Cameron Bateman of the Massachusetts Nurses Association staff described the panic among his daughter’s fifth-grade classmates upon hearing of the election of someone sworn to deport many of them. Lily Huang, a life-long Quincy resident, representing Jobs with Justice, promoted hope by using the example of last Fall’s successful No on 2 campaign to defend public education despite millions of dollars brought in from out of state. Nicole Sullivan from Boston Feminists for Liberation described deceptive practices used to block access to safe abortions and invited all to join efforts to defeat those practices. Nino Brown, representing the ANSWER coalition, urged folks to go to Washington on January 20th to protest the Inauguration, and invited anyone interested to get on the buses chartered for this purpose. Many raised their hands in support of a suggestion that Quincy, the City of Immigrants, be declared a sanctuary city, a safe haven for immigrants and refugees no matter what papers they may have. Sue Chandler, executive director of DOVE, Quincy’s women’s shelter, told of its role as a secure refuge from abuse no matter a woman’s immigration status. Many volunteered to help form a healthcare justice group in the area, in light of threatened federal cutbacks in access and resources. Thanks were offered to the church and the South Shore Coalition for supporting the failed effort two years ago to save Quincy Medical Center from the medical marketplace. Practically everyone’s access to affordable, quality health care is now at risk. Women’s access to reproductive health services may be threatened by the emerging national agenda, so specific suggestions on actions to be taken were well-received. Support for Planned Parenthood and its many health services were expressed. Everyone was invited to join the local contingent meeting at ten thirty on the morning of January 21st to take the T to the Boston Women’s March starting on the Boston Common at eleven. Fore River Residents Against the Compressor Station sent a delegation to this meeting. The dangers of the projected fracked-gas compressor station in North Weymouth, MA were recounted, threatening such neighborhoods as Germantown and Quincy Point, environmental justice communities. All were invited to join in the active opposition. Several local former delegates to the Democratic National Convention pledged to Senator Bernie Sanders urged a strong South Shore presence at the January 28th Worcester statewide meeting of Our Revolution, the continuation of the Bernie Sanders campaign. All those interested in building any of these initiatives can email SouthShorePeoplesNetwork@gmail.com. Sandy Eaton, RN has spent fifty years delivering bedside care to patients in a variety of capacities in Massachusetts’ extensive healthcare industry. 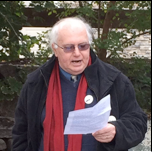 A founding member of the Massachusetts Campaign for Single Payer Health Care, he had served for many years in the leadership of the Massachusetts Nurses Association, and he currently represents MNA on the steering committee of the Labor Campaign for Single Payer. Eaton has written and spoken extensively on nursing, labor and healthcare issues, and currently co-edits the newsletter Health Justice for Boston/Salud con Justicia para Boston.